Designed with the beginner in mind, the HobbyZone Mini Apprentice S includes an array of features that make taking to the skies easy in spaces as small as your local park. Beneath its durable Z-Foam exterior, pilots will find a robust brushless 370-size motor and 18A ESC. SAFE Technology provides multiple flight modes to progress through and the security of instant recovery at the push of a button with the included Spektrum DXe radio transmitter. A large, easy-access battery compartment makes installing the included 3S 1300mAh LiPo battery hassle-free. When you’ve advanced your skills, optional floats can also be added for dynamic takeoffs and landings from small bodies of water. Get behind the sticks of the HobbyZone Mini Apprentice S today and turn your dreams of flight into reality tomorrow. 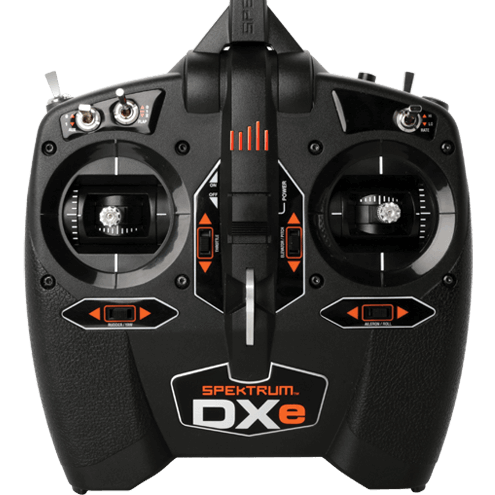 The Spektrum DXe combines the versatility of a programmable transmitter with the simplicity of a basic sport radio. Instead of having to reconfigure a bank of servo-reversing and wing-type switches every time you want to fly a different model, the DXe lets you instantly change those settings using a mobile device or PC. The DXe transmitter comes only with the Ready-To-Fly version.